Speed, deathcore, tech metal, djent… pick your poison! Over 900 metal drum loops to create powerful metal drum tracks. Pure heavy metal drum loops for speed metal, deathcore, death, tech metal, djent. Part of the one and only Double Bass Mania Series! Your metal drum tracks deserve nothing less than what you bring to your music – blood, sweat, tears – so get the live metal drums that will take your songwriting to a new level of brutality. Your music needs Double Bass Mania VIII. Power and Precision. Speed and Aggression. Brutal and Insane. This is what metal drum samples are all about. Double Bass Mania VIII unleashes precision metal drumming for guitarists, bassists, producers who work in a number of metal styles, including speed metal, deathcore, grindcore, death, tech metal, or djent. Get ready to inspire your next metal songwriting project. 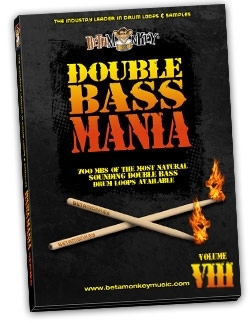 Focused on tempos between 120 bpm and 160 bpm, Double Bass Mania VIII unleashes over 900 drum loops, including grooves and fills, to inspire pure metal drum tracks. 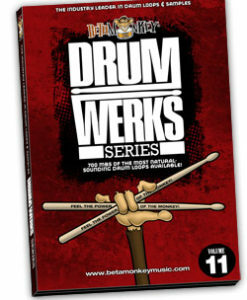 100% live metal drumming performances power this collection that will seek and destroy in any DAW you choose to use. Double Bass Mania VIII is the faster follow-up to Double Bass Mania VII. Together, you will find no better resource for modern metal drum tracks anywhere. Double Bass Mania VIII covers a wide variety of groove styles including double bass runs, syncopated broken double kick patterns, half-time breakdowns, double-time feels, skanks, blast beats and more. All the groove feels you need – they’re all here in both straight and triplet-based feels. All grooves are 4/4 based. Need fills? Each tempo folder delivers all the fills you’ll need to create seamless transitions between loops. We’ve included intro fills, transition fills, pick-ups, and outros, ranging in length from less than a bar to fours or more. Powerful and essential metal grooves to use for songwriting projects or simply jamming and riff inspiration. Are you ready for the brutal rhythms to take your music to the next level? Are you ready to take your songwriting to the next level? Double Bass Mania VIII will make it happen. Modern Speed and Tech Metal: This collection of metal drum loops is geared for modern metal artists, whether you write speed metal, deathcore, grindcore, death, tech metal, or djent. The mix is modern – punchy, loud, powerful and the drumming is influenced by the latest wave of metal bands. The grooves are precise and pounding. Yet they retain the human feel that is often missing with the abuse and misuse of drum machines and virtual instruments in many recording rigs. Up Tempo Speeds: This metal sample library spans the tempos between 120 bpm and 160 bpm: 120 bpm, 130 bpm, 140 bpm, 150 bpm, and 160 bpm. Included in each tempo Groove Folder are half-time as well as double-time loops as well. If you need the speed, DMB8 delivers. Extensive Drum Samples: All drums recorded for Double Bass Mania VIII were captured in a single recording session. Result? A cohesive loop and sample collection. Add single drum accents where needed or sequence custom drum track patterns. Create custom drum virtual instruments in the software of your choice and use for MIDI sequences. Over 250 MB of samples. 905 original, royalty-free drum loops. 1.12 GB 24/44 loop and sample content (772 MB 16/44) available as 16/44, 24/44 WAV, APPLE LOOPS, and REX2 loop formats. 256 MB multi-velocity drum samples. All drums and cymbals used in recording sessions included. This includes drum samples for: one kick drum, three toms, one snare, two crash cymbals, two china crashes, one ride cymbal, and two hihats. Complete range of velocities provided in drum samples. 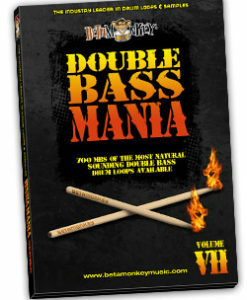 Double Bass Mania VIII Review: Read what MusicTech Magazine had to say about these loops. I actually downloaded the samples in error, thinking they were midi loops. I was pleasantly surprised to see wav files and went for the 24 bit versions to use in Reaper. So when i want to demo an idea that I have in my head, I have a library I can turn to, quickly and easily. I know you have a tons of people hit you up to share what they are doing with your product, and I am no different! lol. I just wanted to share an instrumental Progressive Metal Album I put together using Beta Monkey Loops. I used the full “Double Bass Mania” line. Your products are by far the best I have found and it really adds a sense of power and professionalism to recordings. Thanks again for the great work, I look forward to your next series! 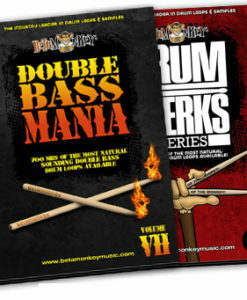 If you’re after some intense metal drum grooves to add power and excitement to your tracks, then you might want to check out Double Bass Mania VII from Beta Monkey Music. Recorded and mixed by one of metal’s leading engineers, the library contains over 1GB of deep and punchy toms, fierce snares, and fast but tight kick-drum rolls. The playing really is world class, with some blistering fills and high octane beats delivering straightup metal grooves alongside more complex syncopated patterns and alternative time signatures. Get some serious metal drum performances into your music today with Double Bass Mania VIII: Metal Drum Loops.